When Scorpio and Aries meet for the first time they will be irresistibly attracted to each other. The mysterious and intense Scorpio will catch the eye and interest of Aries. Scorpio will be drawn to the energetic and magnetic Aries. Aries’ love for excitement and adventure appeals to the fun loving side of Scorpio. Both Aries and Scorpio will have great time getting to know each other better. Initially, the deeply passionate Scorpio is a good match for the fiery Aries. Relationship glitches arise as both are strongly independent, stubborn and unwilling to meet halfway. Both the dominating signs will want to be the leader in this combination, aiming for same role in their relationship. This can spell trouble. Aries and Scorpio however can learn to give way and in doing so their love for each other can become stronger. To allow the positive aspects of this relationship to grow, both Aries and Scorpio must avoid getting into a battle of egos. Aries will have to restrain any flirtatious behavior as this will cause Scorpio to fly into a jealous rage. Scorpio tend to be extremely possessive and jealous. And the jealousy more often than not disturbs their relationships and affects their peace of mind. Scorpio needs to feel totally secure and also finds it hard to forgive and forget whereas Aries will seldom hold a grudge for long. Aries always shows concern and has consideration for others, Aries has the ability to make others feel good and can easily win the Scorpio over. 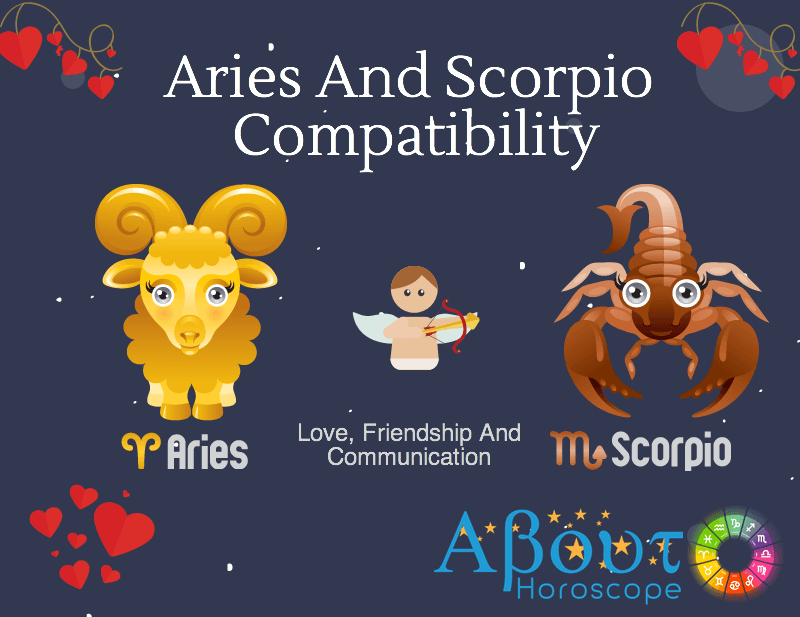 The overall compatibility between the combination of Aries and Scorpio can be wonderful. Scorpio is all set to melt the heart of Aries. This is indeed a unique and intense combination from the beginning. But the key, lies in how they bring this initial attraction to a higher level of relationship. Aries man will be captivated by the beauty and charisma of a Scorpio woman. Aries man is a straightforward lover while Scorpio woman likes clear endings and beginnings, with no grey areas in between. They look great together: both are elegant, beautiful, magnetic, charismatic, Aries and Scorpio happily appear in public together and flaunt their relationship. Aries man may be temperamental, but shows his anger only when he is severely hurt. He is not aggressive; his views about the world are somehow naïve but he knows how to live a carefree and easy life. A Scorpio woman acts like a shy, timid and modest person, but this is at all not so: Scorpios are known to be emotionally discreet. Only an Aries man will know how to unmask the mysterious Scorpio woman. The self-confidence, strong will power and aggressiveness of an Aries man may draw a Scorpio woman. Her deep passion will be well matched by his fierceness and she will find his love for adventure and excitement quite appealing. Still, the basic personality differences remain and this may make their union a little difficult. Both of them have to go their own way and neither will be ready to submit to the other. The plus point is that her mysterious ways will always charm him and she will love the attention he showers. They just have to learn to respect each other and give in, by turns. Instant attraction is one of the things you notice when an Aries meets a Scorpio. However, making that chemistry last, is an entirely different matter. Aries woman would like to control things, which will hardly be acceptable to a Scorpio man. Her admiring glances for other men are bound to get his jealousy meter rising and I assure you, this isn’t a very good sign. The envious, selfish and controlling attitude of Aries is hard for the Scorpio to match up with while the Aries hate the mysterious and doubtful nature of the Scorpios. It takes a lot of patience for an Aries Woman to put up with the silent and secretive nature of a Scorpio Man. It’s not that he doesn’t talk about things; he is not comfortable talking about himself. He’ll talk about what he does, but not who he is. From his deep and powerful passion comes a strength that is almost impossible to resist, or to overcome; a typical Scorpio is what used to be called “the strong, silent type.” Patience is needed for the strong, silent type. Aries woman will love the mystifying and intense traits of the Scorpio man and with him she will never ever get bored. Her independent and spirited nature is a powerful factor in Scorpio’s attraction to her, but he will try to help her become as cool and well-poised as he is. Aries woman shouldn’t try to make him adapt to her outwardly expressive emotional pattern because he won’t. Although he will love her ferociousness and vivacity, he will not be influenced to act in the same manner. The reliability and protectiveness of the Scorpio man always clicks her while her individuality and innocence makes him fall for her instantly. Both of them share the common emotion of passion which is raw in Aries and ripen in Scorpio but still they enjoy each other’s sides well. Aries and Scorpion combination may not provide the required frequency or compatibility to carry on a good and meaningful relationship. However, it is the strong passionate nature of both Aries and Scorpio that can keep this relationship going. It will take some time for these two signs to get used to their differences. Aries and Scorpio thrive on drama and both will take their chances as they love the risks involved. As the relationship moves forward, each of them will be tolerant to each other, better understand each other, accept each other the way he/she is. Both of them need to control their personal tiffs to maintain harmony and make this relationship last. Scorpio and Aries will always have ups and downs but as long as they remain in love, this can lead into a loving, stable and secure relationship.